The highly anticipated release of Apple's latest operating system has been met with a roaring success and after a month of use at impulsegamer, we can finally inform our readers of this impressive upgrade. A neat place to work. Leopard brings a stunning new look to the desktop, and Stacks provides a great new way to keep it clean. Give your files the rock star treatment. 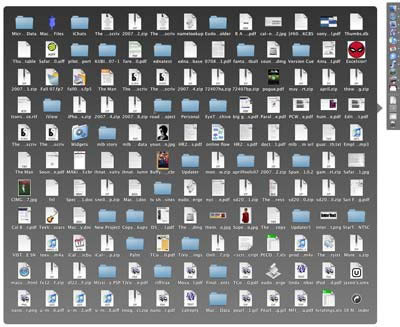 See your files right in the Finder and browse through them with Cover Flow. And make distant machines look like they appear nearby with the new Sidebar and Back to My Mac. Instantly view full-size previews of your files without opening an application. Automatic backup is now built right into your Mac. With a simple one-click setup, Time Machine keeps an up-to-date copy of everything on your computer — and if you ever need to recover a lost file, Time Machine will virtually take you back in time to find it. The installation of the Mac OS X 10.5.1 took around an hour to successfully install and we did experience some issues with the installation process with the program freezing and a reboot of the system was needed. However once these initial hiccups were rectified, the operating system successfully installed on our MacBook PC that kept all our documents and software settings. There were a few programs that needed to be reinstalled, however this was kept at a minimal and the overall installation was quite impressive. We also installed the operating system on a blank hard drive that had no installation issues whatsoever so users should be made aware that they may experience some installation issues if they are running older Mac operating systems. Although on our fresh system, Leopard was considerably faster than one that was running the previous Tiger OS. 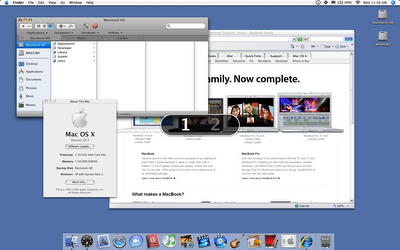 Once the installation was completed, the most noticeable feature of Mac OS X 10.5.1 or Leopard is the streamlined interface that makes accessing documents and programs a much easier task. Users familiar with previous operating systems such as Tiger should have no issues whatsoever when making the migration to Leopard. A great new feature of Leopard is the "revamped" Finder interfacethat easily allows you to search, categorize and display document information that makes this a painless procedure. You can even click on Today's date and it will display all the files that you have modified in chronological order. Leopard has some great new connectivity features and whether connecting to the internet via broadband or connecting to new networks and devices, the operating system automatically configures these additions with minimal to no input required from the user. 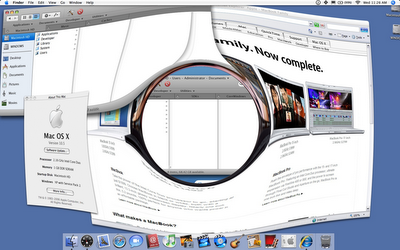 If you are heavily reliant on multitasking, Mac have assisted the user in de-cluttering the interface with the use of "Spaces" or virtual desktops that keeps all your applications neatly open in their own separate areas. The new Quick Look feature also assists in previewing documents that works for a variety of different file formats. For instance, by clicking a Microsoft Word file or QuickTime movie, Quick Look will display the file which is great for finding that document or movie when you are a little dubious as to where it is. The other new feature is Stacks that allows you to stack files into certain categories that makes it easier for managing your files. Mac have also introduced a great backup feature called "Time Machine" that uses an incremental system of backups that means, the operating system will backup the file only if it has been changed. Incremental backups are extremely speedy and it ensures your system's performance is kept free. The interface, although quite simplistic is quite powerful and accessing backed up files is quite a straight forward process. Definitely a great feature for those users who do not use backup systems, however the only side effect of Time Machine is that it does not support bootable discs which does makes things a little more tricky if your entire hard drive should fail. My favourite feature of Time Machine is that it automatically detects external hard drives and with just a few clicks, our entire hard drive was being backed up to a USB hard drive. Users who use chat programs will be pleased to know that Leopard also has iChat which allows you to chat to other Leopard users and best of all, you can even share your files and access each other's desktops which is great for those technical issues. The system allows you to record iChat conversations (great for podcasting), even save them as audio and video files. For those wanting to be a little creative, Apple have included iChat Theatre that allows to create strange pictures of you or there are the stock standard avatars to select from. Multiple chat windows can even be tabbed to save confusion. Apple Mail returns with version 3.0 that has a new streamlined interface and best of all, it's considerable faster than previous versions. The program supports RSS feeds that is great for reading your favourite RSS Feeds with their latest updates. Mail 3.0 features some great templates for your e-mails and even a To-Dos area, nicely round this program out. The program also synchronizes with iCal 3.0 which is a powerful and innovative calendar program. iCal is great for offices as it can keep a track of everyone's calendar and match that with the new CalDAV Group Scheduling option, provided you have a compatible CalDav server and scheduling meeting has never been simpler. The OS supports the Wikipedia dictionary system which is built into the system, provided you are connected to the internet. If not, the New Oxford American Dictionary works just as well, however there is an option for Australian users as well. PDF is also supported by Leopard through the user of Preview 4.0 that allows the user to perform basic PDF modifications to these files. Supporting annotations and searches within PDF documents has never been simpler on the Mac. Mac OS X 10.5.1 features a sturdy firewall program to prevent any nefarious attacks on your Mac and includes the new "Sandbox" feature that prevents your applications from being hijacked by external sources. For parents, the system also contains a great parental control functionality and allows parents to add time limits and even activity loggers to monitor their children's internet usage. Apple's own internet browsing program Safari 3 is one of the better programs available on the market which has had a slight face lift when compared to the previous version. The best part of Safari is the ability to take a snap shot of a webpage and turn this into Dashboard widget. The system contains a great DVD player for users who watch movies on their Mac that has a remote control like interface, ensuring navigation control that can be used by a variety of people of all different skill levels. Other features such as Auto Zoom, Time Skip and even a Scratched Disc Recovery option that attempts to play even the most damaged disc nicely round out this program. In conclusion, Mac OS X Leopard is a very powerful operating system that improves considerably since Tiger and does give Windows Vista a run for its money. Vista versus Leopard? Leopard easily wins the battle from its innovative interface and useful features that caters for a wide variety of computer users. The majority of software is great, although it does need some tweaking in certain elements, however this is quite minor and the only issues we had with the operating system was with the installation but for those seeking the latest and perhaps greatest, than Leopard should be a contender.